The main point of 1 Corinthians 11 is stated in verse 3: But I would have you know, that the head of every man is Christ; and the head of the woman is the man; and the head of Christ is God. It’s not so much about wearing a piece of cloth on your head or having long hair or not since in verse 16 we are told, But if any man seem to be contentious, we have no such custom, neither the churches of God. It’s about God’s created order; man is head over his wife and the wife should live in subjection to her husband. God doesn’t contradict Himself. 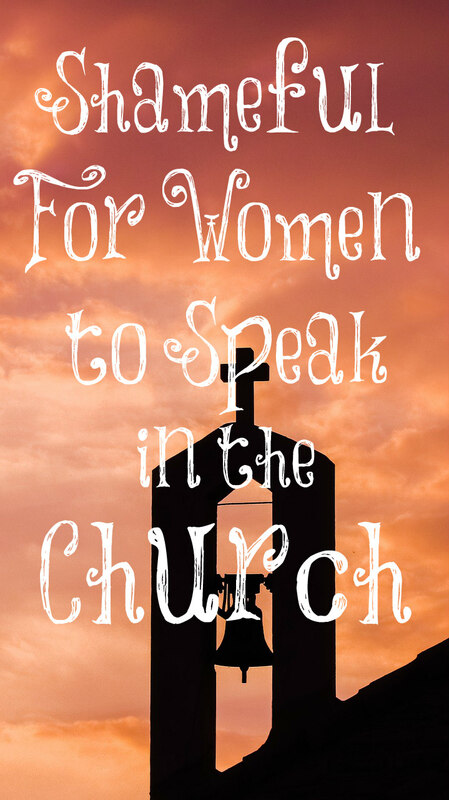 By instructing women to be silent in the church four times and to be in submission to our husbands many times, He has made His will clearly known to us. Either you take Him at His Word of you try to find ways to disobey Him by making up your own rules. It’s your choice. 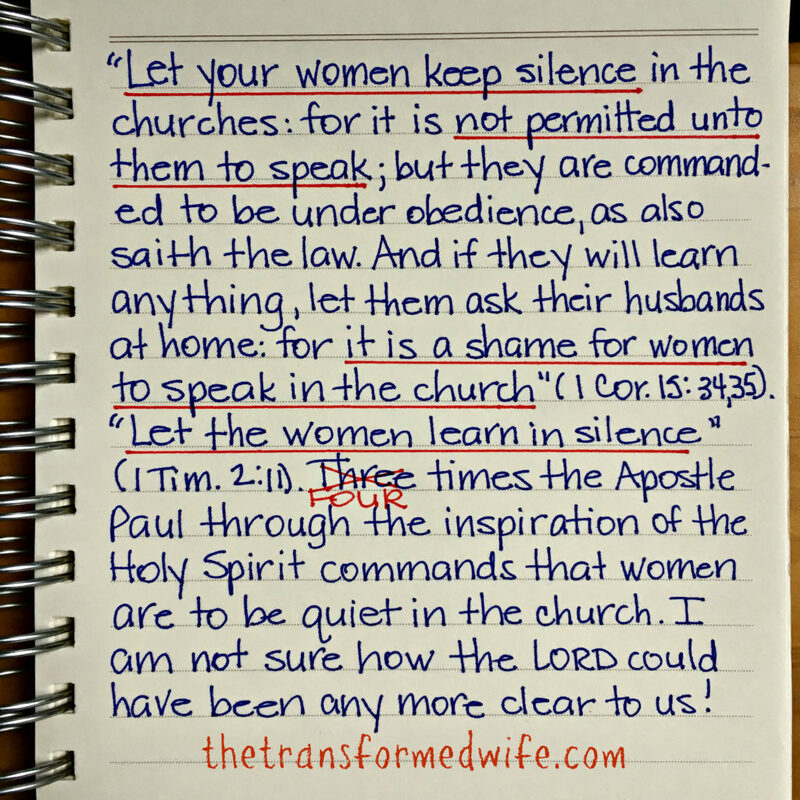 You may want to share this post with him, Karla, and see what he thinks since Scripture is clear that women are to be silent in the church but then leave the decision up to him since he is your head! I look at the part that states that they have “no such custom, and neither the churches of God” and the entire chapter is mainly about a wife’s submission to her husband, her head. I believe it comes down to conviction and what a wife’s husband wants her to do. If he wants her head covered literally, then she should wear a head covering but if not, then she should not. I’ve had this conversation with a family member before and let’s just say we have to agree to disagree. He uses the “the culture at the time” argument saying that his professor told him that at the time it was common for women to yell across the room wanting something explained to them and that was why this verse was put there. I just have to say that we will never see eye to eye on this. He also tells me that because my husband isn’t saved, the verses about obeying and submitting don’t really apply. Again, I just have to tell him we will never agree on that one either. I have heard this argument too, HH, and it’s as if women are no longer loud and forceful. Ha! Women are still the same and want to be in control. We talk too much and act like we know everything but we are definitely more easily deceived than men and men were made first by God to be the leaders. Godly women love God’s ways and will for them and don’t try to fight against them. That women and men were separated in church is a false teaching held onto. They were not separated and did not yell across the room. Families were generally grouped together and the children obeyed. The men were to teach their wives and children at home (speak to them upon wakening and being put to bed). The men were encouraged to take control of (having their household in order, to be elders) their families and lead while the wife was told to follow (not allow her husband to lead). This is one the evangelical myths used for that verse to make sense in THIS culture. It wasn’t then and isn’t now uncommon for women to start asking questions regarding the apostle’s teachings about the prophecies of the old testament being fulfilled in Christ. Back then, women had no biblical education for the most part. Imagine a new teaching and having a new life in Christ to learn! Remember it was and is christianity that has given equal worth to women, so in their freedom they pushed the limits of their own submission. This was also due to the fact that apostles moved on from one place to another and it was the husband/father’s responsibility to grasp what the teachings were and to teach them to his wife and family and not “worship” the apostle (pastor as so many wives do). You are right, it was telling women to be submissive to their husbands and learning from their husbands. Biblical truth is hard even for the most mature Christian. Today’s society would have you believe that it’s ok to take a softer approach. The thing is whatever we are commanded to do isn’t god asking if it’s fits your life style first?? We all need to take a good hard look at ourselves and ask are we truthfully living out Christ as our savior or are we just in our Christian comfort zone?? God’s commands are perfect and the closer we become in obeying them with the Spirit’s power working in and through us, the more we are able to see how perfect they are for us! Thank you, Rob. It doesn’t help that there are certain widely accepted/used versions of the Bible with verses, discussing this very topic, that have been intentionally mistranslated. Here’s some interesting background info. Though the comments there can get pretty salty, they’re also usually pretty informative. I have read that article in the past and it makes sense why some popular women authors and speakers now have no problem teaching and preaching to men if they’ve been given the authority to do this by men. They didn’t take these positions, but were “assumed” into it by male leaders in the church. This is not okay according to the Word. Only the Lord has the authority to allow women to teach men in the church and He has made it clear what He wants. Yes, without question. There are multiple biblical witnesses to clear up any “ambiguities”. And if their ears weren’t itching to hear something else – if they had ears to hear, these women would know better. Most of the women i know who speak in church are arrogant and have admitted they like to ‘perform’. Ugh! Just disgusting. I have heard that some women take this to the extreeme and wont even direct their children quietly during church. (‘Shhhh! Be quiet, do you need the toilet? Stop annoying your sister!) That view is ridiculous. I just take it as i cant speak publicly in the church. Or bail the pastor up afterward because i took issue over something he said. Yes, you are right, but we must be careful to not disrupt the church service in any way. I have sat in front of women who chat quietly with each other for a long time during the sermon and it’s very distracting. It’s best if you can train your children to sit quietly in church, too, so as not to distract others. They can learn to do this but it does take training. During a church service isn’t the time to be scolding them, in my opinion. Thats right. Our children will sit quietly thru pretty much everything. But we occasionally have issues with our youngest ones. If they need spanking we take them out of the service. But its pretty rare. Ive sat infront of women who talked endlessly in the cry room about ages of their children , favourite tv shows and what they did all week. I was infuriated by the end of church as i missed the entire sermon as they were so loud. And they had noisy toys in the cry room too. Church is not a place to play and eat. Feed your kids before you come and only allow toys at home or friends houses. And crayons and pencils during church are horrid too. All of my kids are trained very early to sit still and be quiet during church without entertainment. And all of them love church. I have always been curious if the verses you refer to not only mean that women shouldn’t be preaching in the church, but is it OK for them to do any of the readings? In my church there is a woman (an elder, if you will) who occasionally leads the entire service when the pastor is away. I feel like that is against God’s Word here, but what about just standing before the congregation to read a Bible passage? If we are not throwing in our own opinions but merely reciting scripture, is it OK then to speak? I have always wondered how literally to take these verses. Thanks and blessings! For one thing, women are not to be elders in the churches. A specification to be an elder is the “husband of one wife.” This woman has no God-given authority to lead a service while the pastor is away. I personally wouldn’t stand in front of the congregation to read scripture or pray. I believe these are what men should do. That was my bad usage of the term “elder,” I just meant she has been in the congregation and very involved in the church for a long time. She’s incredibly modest but yes, I agree she shouldn’t be leading the congregation, even if the pastor requests it. Thanks for the feedback and clarification! Things to pray about and consider. God also commands you to eat his flesh and drink his blood, and says it several times. Yet for some reason those verses are okay to ignore? If you knew your Bible, Emily, you would know that this meant eating bread (His body which was broken for us) and drinking wine (His blood that was shed for us) for communion in remembrance of Christ’s death on the cross and His shed blood for the forgiveness of our sins. It’s something our church does once a month.